Welcome to Ear Falls, Northern Ontario, Canada, Fishing and Hunting. If your looking for the best fishing and hunting vacation you've come to the right place. 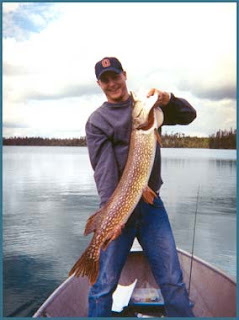 Pakwash Lake Camp has long been known for its excellent fishing, beautiful scenery and abundant wildlife. It is also a place to relax and enjoy all that the northern wilderness has to offer. The Pakwash Lake System is situated at the junction of three mighty Northern Ontario rivers, the Chukuni, the Trout and the English. These three rivers drain much of the region and are responsible for the high productivity of these lakes. Fish for walleye, northern pike, smallmouth bass, muskellunge, lake whitefish and yellow perch. Fish and explore over 31,000 acres of water and 100 miles of shoreline on four different lakes. Our resort provides light housekeeping cottages and RV facilities amidst the spruce forest on the eastern shore of beautiful Pakwash Lake. Our housekeeping cottages are fully equipped for your convenience and include full bathrooms and kitchens, and comfortable bedrooms compete with linens. Other camp features include RV sites with water and electrical hookups, docking and boat launch facilities, fish cleaning facilities and a camp store for your convenience. Please take the time to browse our website. We look forward to hearing from you and would like the opportunity to provide you with the best Northwestern Ontario fishing vacation possible. Trout River Lodge is located deep in the Canadian wilderness of northern Ontario, just north of Ear Falls off Highway 105. Our camp offers access to Lake Pakwash, East Lake, Upper & Lower Bruce Lakes, and more via the Trout River. Our 12 rustic, yet comfortably furnished cabins are right on the water and offer kitchens, bathrooms with showers, and views on the river. The lodge is surrounded by pristine forests and lakes, exceptional scenery, and abundant fish and wildlife. 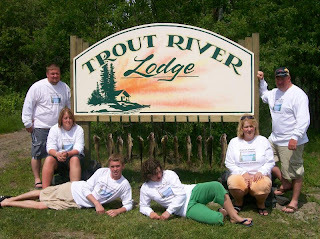 Trout River Lodge offers exceptional fishing adventures for walleye, northern pike, and smallmouth bass. We also offer thrilling bear hunt opportunities in the fall. If just enjoying the scenery and wildlife is what you're after, we're fully equipped for RV's and camping too. Call us today and come visit for your next great vacation! Fish & Hunting Ear Falls, Ontario Canada. Let's Go Fishing and Hunting. Please join us on our Blog and see all the Websites fir Resorts on Pakwash Lake, Ear Falls, Ontario, Canada. All the Resorts are show here below. Thank you for visiting us! Escape, Experience & Enjoy! We offer you these Seven Camps to Consider for a Great Fishing Vacation. Thank you for Considering us for your Fishing Trip! We are located South of Red Lake, just past Ear Fall, Ontario, Canada. We hope to see you on Pakwash Lake, Bruce Lake, Chukuni River, English River, & Trout Lake River. We have set up this Site to help you plan a Great Fishing Vacation with your Family and Friends. We are all located on the Pakwash Lake Water System Please Join us for a Wonderful Canadian Fishing Experience. Welcome to Brownlee's Holiday North Lodge, a drive-in, light housekeeping, fishing camp located on Trout River with easy access to Pakwash Lake in Northwestern Ontario. Pakwash Lake is famous for its phenomenal fishing, breathtaking scenery and abundant wildlife. Come, relax and enjoy a truly Canadian fishing and wilderness experience. Brownlee's Holiday North Lodge is a clean, comfortable and family owned camp, offering modern housekeeping cottages in a relaxed and peaceful atmosphere. Our personalized service and great hospitality makes Brownlee's Holiday North Lodge a place you will want to visit year after year. It's your dream vacation come true- a fly-in vacation to a remote Northwestern Ontario Canadian wilderness lake. 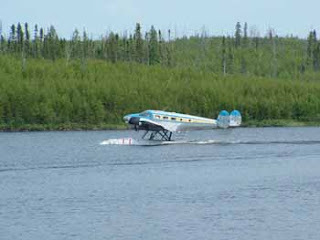 Showalter's Fly-In Service gives you a choice of 11 outpost cabins, all excellent for fishing or wilderness adventures. and more in the pristine Canadian wilderness. Wildlife viewing opportunities for moose, bear and birds including eagles, Canadian loons, Canada geese and many species of duck abound.